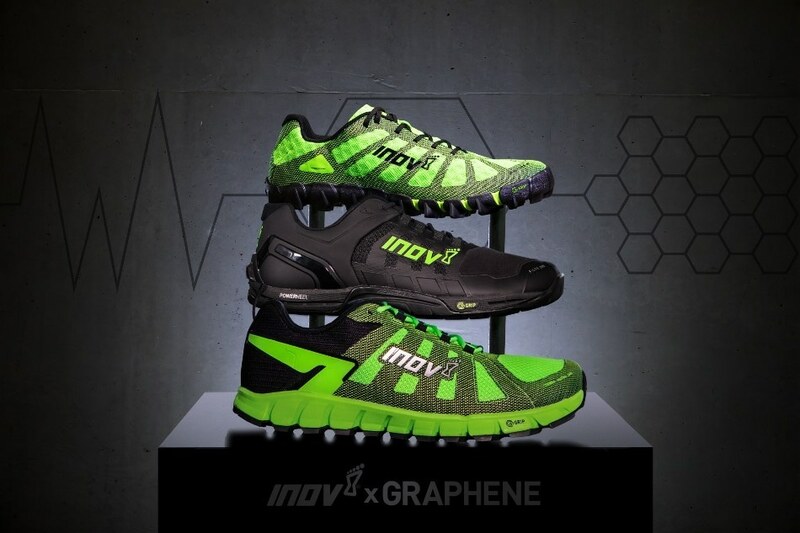 The University of Manchester and British brand inov-8 unveil the world’s first-ever sports shoes made using graphene, which is the world’s strongest material. Working together with graphene experts at the National Graphene Institute, the brand has been able to create a graphene-enhanced rubber. They have created rubber outsoles for running and fitness shoes that when tested outlasted 1,000 miles and were scientifically verified to be 50% harder wearing. Compared to steel, graphene is 200 times stronger, and with a thickness of a single atom, it is the thinnest possible material, meaning it has a number of exceptional properties. inov-8 is the world’s first brand to employ the superlative material in sports footwear, with its G-SERIES shoes ready for pre-order from June 22nd prior to going on sale from July 12th. In December last year, the company announced its resolve to transform the sports footwear industry. Six months of feverish anticipation later, inov-8 has now removed all secrecy and allowed the world to see these game-changing shoes. Over the last 18 months we have worked with the National Graphene Institute at The University of Manchester to bring the world’s toughest grip to the sports footwear market. Prior to this innovation, off-road runners and fitness athletes had to choose between a sticky rubber that works well in wet or sweaty conditions but wears down quicker and a harder rubber that is more durable but not quite as grippy. Through intensive research, hundreds of prototypes and thousands of hours of testing in both the field and laboratory, athletes now no longer need to compromise. Using graphene we have developed G-SERIES outsole rubbers that are scientifically tested to be 50% stronger, 50% more elastic and 50% harder wearing. We are delighted to put graphene on the shelves of 250 retail stores all over the world and make it accessible to everyone. Graphene is a versatile material with limitless potential and in coming years we expect to deliver graphene technologies in composites, coatings, and sensors, many of which will further revolutionise sports products. Sport and Nanotechnology: Are the Big Sports Looking to Go Small? The G-SERIES range comprises three different shoes, each carefully designed to match the requirements of athletes. THE MUDCLAW G 260 is meant for running over muddy mountains and obstacle courses, the TERRAULTRA G 260 is designed to handle running long distances on hard-packed trails, and the F-LITE G 290 is ideal for crossfitters working out in gyms. Each shoe model consists of graphene-enhanced rubber outsoles and Kevlar - a material used to create bulletproof vests - on the uppers. Remarking on the patent-pending technology and the partnership with The University of Manchester, inov-8 CEO Ian Bailey said: “This powerhouse forged in Northern England is going to take the world of sports footwear by storm. We’re combining science and innovation together with entrepreneurial speed and agility to go up against the major sports brands—and we’re going to win. Graphene is derived from graphite, which was first mined in the Lake District fells of Northern England over 450 years ago. inov-8 too was founded in the same fells, although a lot more recently in 2003. The brand at present trades in 68 countries around the world. The researchers who initially isolated graphene from graphite were bestowed the Nobel Prize in 2010. Building on their groundbreaking work, a team of more than 300 staff at The University of Manchester have initiated projects into graphene-enhanced prototypes, from medical devices and sports cars to airplanes. Now, the University can include the graphene-enhanced sports footwear to its list of world-firsts. The collaborative research was aided by the EPSRC Impact Acceleration Account and Innovate UK Knowledge Transfer Partnership. Where can I get a pair of these shoes.